100 years ago the guns fell silent on the world’s first truely global war. In the run up to Remembrance Sunday on 11th November 2018, thousands of volunteers will be helping to distribute paper poppies to the general public. Poppies will be on sale from 25th October until 11th November. If you are looking to purchase a Poppy to pay respect to all who served, sacrificed and changed our world, you will find these volunteers on the high street, shopping centres, supermarkets and train stations and you can also purchase your poppy online at the PoppyShop. The money raised from the sale of poppies goes to The Royal British Legion Benevolent Fund to help armed forces’ dependents, veterans and those bereaved. As well as the paper poppies, there are also plenty of other items available on the PoppyShop website, such as badges, pins, bags, gifts, clothing, jewellery and homeware. 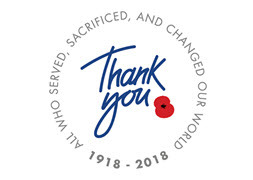 By shopping at the PoppyShop not only are you helping The Royal British Legion to offer social, emotional and financial care and support to thousands of veterans and their families but you can also support the causes close to your heart with free donations. So how do you wear a poppy? A spokesman from The Royal British Legion said “Simply wear it with pride”. So there is no right or wrong way to wear your poppy. Some people say the poppy should be worn on the left side, so it’s on top of our hearts and shows that those who died are close to us. Some people say that the leaf of the poppy should be worn at the orientation of 11 o’clock, to symbolise the eleventh hour, of the eleventh day of the eleventh month. However you wear your poppy, wear it with pride!